I have been struggling for a while with trying to understand and depict in an easy-to-relay fashion the organizational structure of my employer – it may sound silly, but it turns out it is not all that easy to describe or represent our rather 3-dimensional management structure in EMC presales. I found that Neo4J is easily capable of not only constructing the necessary relationship models, but also of allowing easy traversal of the graph to ‘walk’ the EMC presales organization. Our presales organization is not only somewhat 3-dimensional, it is also not strictly uniform from division to division, theater to theater, or business unit to business unit. Asking a question such as “who is my peer in that other division?” (or worse, “who is my peer’s manager in that other division”), while unnecessarily convoluted in an RDBMS, is relatively straightforward in Neo4J. Then, while reading an article on How to Use Neo4J for Natural Language Search, the author made the point the value a graph brings to a complex data modeling problem isn’t just that it can model relationships in a more agile fashion than an RDBMS, it is actually the metadata that holds the value. That is to say, the questions a user will be asking of a graph database are answered by the nature of the relationships themselves. Put another way, it is not necessarily the objects / nodes that are of interest, but the relationships themselves. Let’s consider a common game that many folks are familiar with- Rock Paper Scissors (also known as Roshambo, though i will refer to it hereafter as RPS). The game is played using hand symbols to represent objects (ummmm…, a rock, paper, and scissors, maybe?). For an understanding of how the game is played, ease see Wikipedia here- Rock Paper Scissors. Ready to get a bit metaphysical? While it is necessary to have representative objects for the players to use to play the game, the objects themselves are immaterial it is the relationships between the objects that imparts significance to them… That is to say, it is how the objects are used that we are interested in, rather than the rock, the paper, and the scissors. If we wanted to try to represent this in a traditional RDBMS, what would we need? Well, we would need a table, and that table would have one or more rows of data, each row representing a single record. It would be easy enough to use a single table with 3 rows, one each for the rock, paper, and the scissors. How would we then represent the relationships? On my favorite show, The Big Bang Theory, Sheldon and the gang use a ‘nerdified’ version of RPS that they call “Rock Paper Scissors Lizard Spock” (click the link for an explanation). In this game, the rock, the paper, and the scissors are complemented by the addition of a lizard, and by Spock (hence the name of the game!). 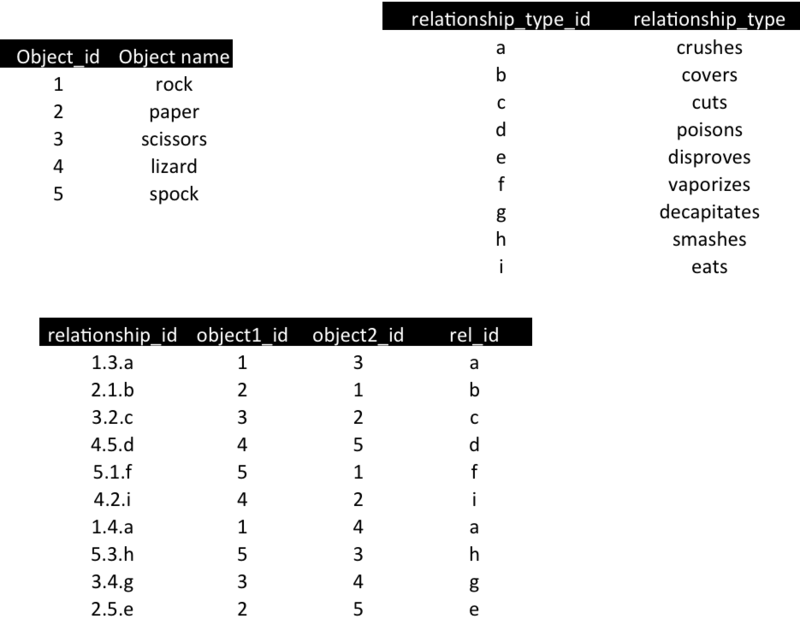 In this diagram, we can clearly capture the relevant information about the relationships between the objects. What’s more, this can be represented easily in a graph database, because the database was designed to be ‘schema-less’, inherently flexible and capable of representing complex relationships as first-class citizens. Furthermore, in the aforementioned article on Natural Language Search, the author makes the point that the value of the graph database is in being able to identify and cache the relationships between objects, as queries to the database will be in the form of “what is the relationship of X to Y,” rather than the types of queries you might see in a traditional RDBMS (“how many objects of type X are there?”)… Since the nature of the questions being asked differ, the nature of the system used to store and retrieve the data must necessarily be different as well. That’s enough for now… I will pursue the nature of the above in a future post. Thanks for reading! This entry was posted in Miscellaneous, Next-Gen Apps, NoSQL and tagged Graph Database, neo4j, nosql, rdbms. Bookmark the permalink.